Yesterday was the first post for my spanking new blog. (See Part One) It was not what I had originally planned for my first post, but the date I had planned on publishing that first post got delayed while Keith finished up some technical and programming details that would make it easier for me to blog in the long run. So when Valentine’s Day arrived and the “mystery” portrait appeared, I went with it. So today I will show you where it is hung in the dressing room, and how I changed up the decor in there a bit. On top of the dresser was a lamp that my late husband loved. I can’t say I was in love with it, but it was on his side of the room, he enjoyed it, and I came to like the quirkiness of it. Keith told me after I said I would move it, that he appreciated that it was going, because he found the monkey’s expression a bit sinister, but since he only had to stand in front of it a few minutes a day while dressing, he had been ok with it. You can decide for yourself what you think about the monkey’s face. He also thought I might be attached to it. Again, sweet person he is, he never voiced a word about it until I was ready to change things up a bit. 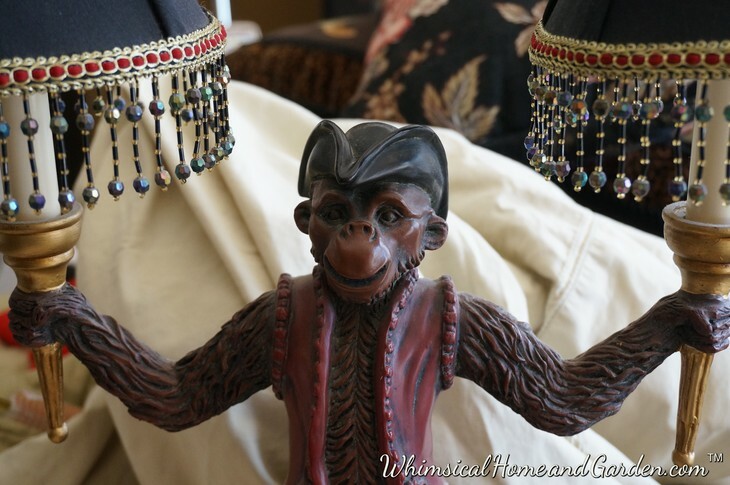 So I took the monkey lamp down, and then the big question was where could I utilize it so it did not make Keith uncomfortable, while still having it compliment the decorating in the space I would place it in. Well, unfortunately, the only room that it might work in was the bedroom, so I ended up first placing it on top of the armoire that directly faces the bed. oops! First the lamp was on the left top corner of the armoire, and when I got down from the ladder to sit on his side of the bed, it was apparent the simian face would definitely be staring down at us, especially at Keith. Is that where the term “Monkey Face” originated, because I am sure at that moment of realization, I wrenched my facial muscles into the same expression of the one on the lamp’s monkey! The monkey was facing and now staring on the diagonal directly to Keith’s side of the bed. Oops again, since I knew he was a bit freaked out by his face in just the limited time it took for him to dress in the morning and again before bed. OK, I took him down and decided to perhaps pack him away for an eventual move to another, smaller home back in NC, but he was heavy, fragile , and would need careful packing and I was not in the mood to head out in the rain to what I call the Newf House, to find a box, packing material etc. Yet, I did not want him sitting around. Sitting on the bed, I looked up again, got back up on the ladder, took off the big basket in the corner, put the lamp back up on the back corner, and pushed him to the middle, behind some tall pottery. Yup, this should work. Placed the basket back on the corner, and that was it until Keith got home from work. 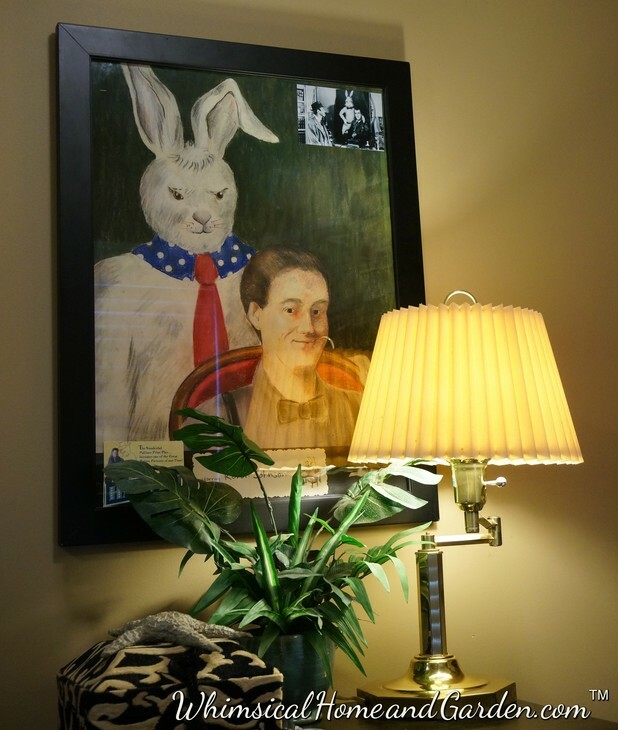 When he came home I took him back to the dressing room and showed him the now hung portrait and the items I placed on the top. He liked it straight away, and asked where I decided to place the lamp. We went into the bedroom and I had him look around and he didn’t see it. I finally pointed it out to him and he laughed. I asked him if it was ok there and he said absolutely. I will still be able to catch a glimpse of the lamp and smile at the memories, while Keith isn’t haunted by a creepy monkey expression. Two now happy people. Thank you Robert! Lots more design to come.